in Lyon @ #fossa2011 as example of openess in other domains. Found the above in my twitter stream the other day so ventured right out of Lurkdom for Nancy White’s presentation and now I’m so enthused I want to tackle this weeks assignment – find stories about social artists in their learning life! Trouble is – no inspiration yet! @MOOCow – Yikes !! You’ve gotten a life of your own !! You’d better come onto this blog. MC: Well thanks G – yup I’ve gotten a learning life! Look no further G, I’m a Social Artist ! G: 🙂 🙂 – sorry MOOCow but that’s really funny ! MC: Don’t I help create social learning spaces where people can work and learn together? Look at me in this pic at Opened11 inspiring Jim Groom to do his thing !! G: It depends on what you mean by working and learning – I don’t see much of that in this or any other MOOC! Why, in my day I’d be up studying at the crack of dawn, 3 lectures before lunch and labs all afternoon before a couple of hours in the library at night. Now that’s real learning! The only exam I ever failed was engineering drawing so at least I learned I was no good at drawing or graphics stuff. 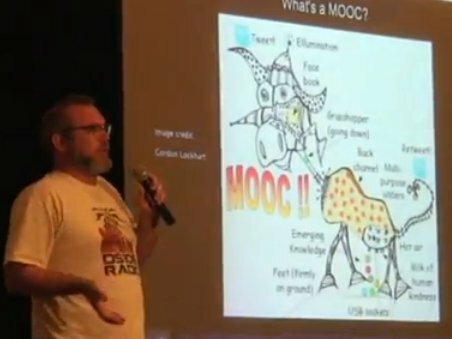 MC: Err .. what about your drawing of me then, the iconic MOOC Cow, now popping up all over the web? G: Huh! – oh that was LibreOffice and I used somebody else’s cow drawing so all the fuss took me by surprise – I’m no artist. MC: But you learned to reuse and remix! Take it from me, MOOCs possess superpowers in the unexpected. G: I’m not saying I haven’t learned anything at all in these MOOCs but I’m quite capable of going off and teaching myself rather than being forced to comment on peoples’ blogs or play silly games in chatrooms. MC: Look G, MOOCs move around in the informal social regions that normally surround other courses, so it’s hardly surprising that quite unexpected things happen. What you learn is unpredictable and uncontrollable and probably not what you think of as ‘academic’. If I could tell you what’s being learned right now in this very MOOC !! People changing long-held beliefs, challenging their employers, taking their communities to new levels, making life-long friends, finding new lovers …. G: Hey! – steady on MOOCow, I am British you know! All I can say is that apart from the cow drawing nothing very unexpected has happened to me. MC: Does it have to be about you? What about your young grandson? MC: You gave him a copy of your drawing so then he wanted to do one for himself. 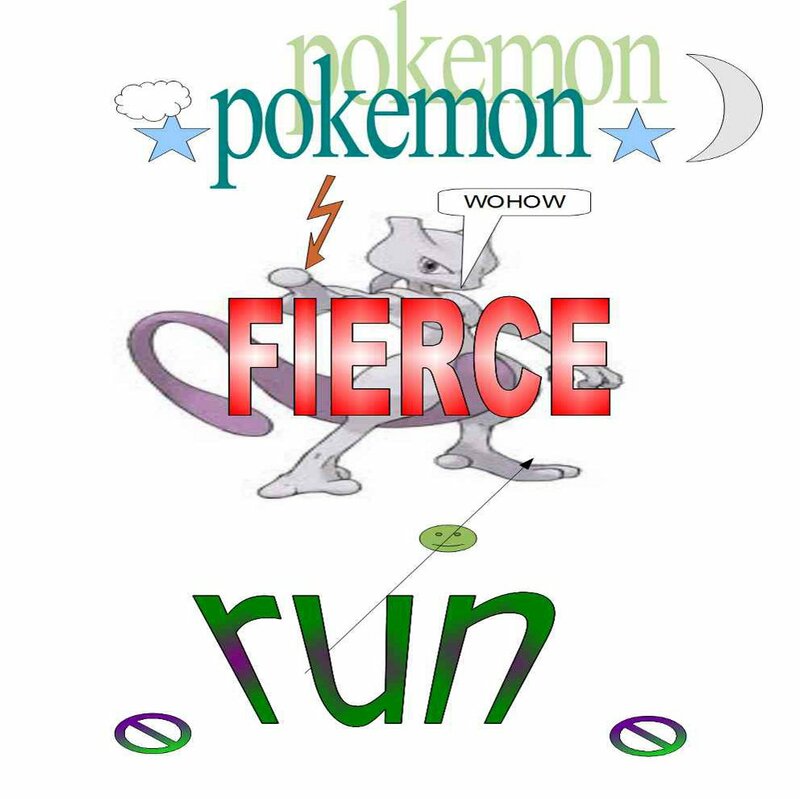 Now he’s learned how to find an image, copy it, load LibreOffice, paste in the image, adorn it with stars and fancy fonts – all by himself and he’s only 7! Here’s one of the pics he did – what do you think of that?. G: Well OK yes, and I’m very proud of him but what’s this got to do with MOOCs? MC: You’ve learned to teach by example G! Look, one of the very few wise things you ever said about a MOOC is that it’s NOT really a course, at least in any conventional sense. The name, ‘MOOC’ has stuck and maybe that’s unfortunate but as far as learning is concerned, expect the unexpected! Like, how’s photography? Grandson (7) follows G’s example and learns to mix and mash his own computer drawings. G: Photography? Now you’re quite off topic MOOCow! MC: Remember that nice Australian lady on your last MOOC who commented on your blog and then encouraged you to put up some photos onto Flickr and then made some really positive comments on them – mediocre though your photos assuredly were! G: I thought they were OK! Hmm … I see what you mean though but I get tired of making comments on peoples’ blogs, particularly when I try to be helpful and they don’t even bother to respond. MC: They’re all in a MOOC for different reasons G and haven’t you noticed how different humans are? Some, like you, are shrinking violets, wouldn’t say “Boo!” to a goose, while others comment on every comment going, blogging and twittering away like mad every single day of the week. Besides, some are not so um, ….. less mature than you. Anyway, I didn’t see you interacting much during Nancy White’s presentation! G: Well, I didn’t know how to work the pencil, I don’t have a mike, she was speaking too quickly, my PC was on the blink – OK I’m British and I just don’t do interaction ! MC: THEN GET OVER IT! – or not, it’s completely up to you G. As a social artist I paint with a very broad brush – you alone decide exactly where you want to fit into the big picture. Well I’m off to do another presentation now but here’s a thought for you. When your grandson’s an old f*** like you he might just want to dig into the archives where I’m storing every single word, letter and pixel generated by you and your cronies on this and every other MOOC – Byeee !! Wow! …. Well I guess this is where I wake up and find it’s all some sort of bad dream? Hmm … think I’d better nominate MOOCow as a Social Artist for the assignment.